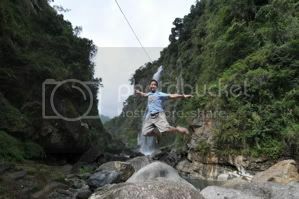 my friend andri has changed his photo blog's banner, and it includes the consolidated jump shots we each had when we went to the bomod-ok falls in sagada last december. since there were only 2 of us at the falls that day, we couldn't get the shot together. 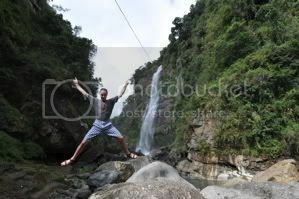 but since i had a tripod, we each took jump shots separately, and he just suggested that we edit it on photoshop. his suggestion was that i use the clone stamp. but for the love of art, my knowledge of photoshop is limited to the most obvious. so given this need to put the photos together, i basically resorted to the erase function. i put my jump shot over his, and i erased the area where he's supposed to be, and voila, we have this photo above. 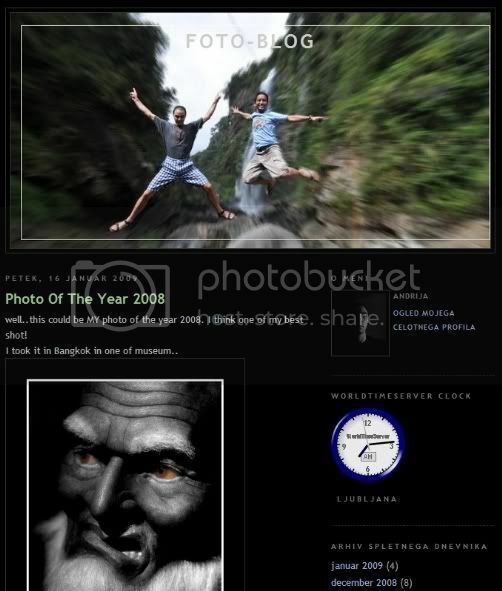 in his banner though, he adds blur to suggest motion towards the subjects (us), which i didn't have in mine (see this). it was my first time to actually edit a photo (other than to add text or to resize it), due in no small part to my personal policy that photography should end after the shutter is closed. everything that comes after is cheating. haha.